In spring 2018, Congress added an additional $500 million to the NIH budget to invest in science to find solutions to the opioid crisis. 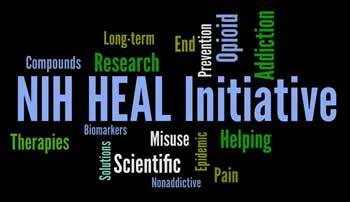 The Helping to End Addiction Long-term (HEAL) initiative is being kicked off today with the announcement of several bold projects across NIH, focused on two main areas: improving opioid addiction treatments and enhancing pain management to prevent addiction and overdose. The funding that NIDA is receiving will go toward the goal of addressing addiction in new ways and better delivering existing forms of care to populations that need it. Developing new addiction treatments and overdose-reversal tools is one of the major projects we will be funding. Three medications are currently FDA-approved to treat opioid addiction, one medication (lofexidine) has just been approved to treat physical symptoms of opioid withdrawal, and naloxone is available in both injectable and intranasal formulations to reverse overdose. But a wider range of options is needed in all three areas. These may involve not only new formulations of existing drugs (e.g., longer-acting depot formulations of opioid agonists or longer-acting naloxone formulations that are more suitable to reverse fentanyl overdoses) but also compounds that target different receptor systems or immunotherapies to treat symptoms of withdrawal and craving in addition to the progression of opioid use disorders. The Focused OUD Medications Development Research Project will consist of a series of high-impact studies that will ideally lead to about 15 Investigational New Drugs (INDs), which would then produce around 5 New Drug Applications (NDAs) submitted to the Food and Drug Administration (FDA). Much research already points to the benefits of increasing the provision of OUD treatment with justice-involved populations, so this is another area that will receive HEAL funds. The Justice Community Opioid Innovation Network will create a network of researchers who can rapidly conduct studies aimed at improving access to high-quality, evidence-based addiction treatment in justice settings. It will involve implementing a national survey of addiction treatment delivery services in local and state justice systems; studying the effectiveness and adoption of medications, interventions, and technologies in those settings; and finding ways to use existing data sources as well as developing new research methods to ensure that interventions have the maximum impact. The National Drug Abuse Treatment Clinical Trials Network (CTN) facilitates collaboration between NIDA, research scientists at universities, and treatment providers in the community with the aim of developing, testing, and implementing addiction treatments. As part of the HEAL initiative, the CTN Opioid Research Enhancement Project will greatly expand the CTN’s capacity to conduct trials by adding new sites and new investigators. The funds will also enable the expansion of existing studies and facilitate developing and implementing new studies to improve identification of opioid misuse and OUD and engagement and retention of patients in treatment in a variety of general medical settings, including: primary care, emergency departments, obstetrics/gynecology, and pediatrics. A great tragedy of the opioid crisis is that so many effective tools already exist but are not being deployed effectively in communities that need them. Only a fraction of people with OUD receive any treatment, and of those, less than half receive the medications that are universally acknowledged to be the standard of care, or they only receive medications for too short a duration. As part of its HEAL efforts, NIDA will launch a multisite implementation research study called the HEALing Communities Study, in partnership with the Substance Abuse and Mental Health Services Administration (SAMHSA). The HEALing Communities Study will support research in up to three communities highly affected by the opioid crisis, to evaluate how the implementation of an integrated set of evidence-based interventions within healthcare, behavioral health, justice systems, and community organizations can work to decrease opioid overdoses and to prevent and treat OUD. Lessons learned from this study will yield best practices that can then be taken and applied to other communities across the nation. The HEAL Initiative is a tremendous opportunity to focus taxpayer dollars effectively where they are needed the most: in applying science to find solutions to the worst drug crisis our country has ever seen.